Schwalbe is a well-known brand in cycling. De company started in 1901 and has its headquarter in Germany. Schwalbe is also partner of some World Tour teams, for example Radioshack-Leopard-Trek and AG2R. Besides those World Tour teams there are several pro-continental and continental teams who use Schwalbe tires. After my first tires were worn out I had to buy new ones. 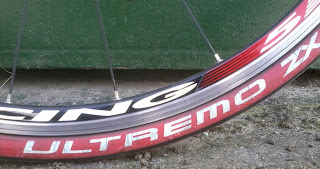 I bought the Schwalbe Ultremo ZX because the reviews where pretty good and it had a good price. There was also a possibility to choose a colour. Besides a good product it is also nice when it looks good, so I bought the red-black tires (one of the 10 possible colours) for the same price as the ‘normal’ black tire. I had no real problems with mounting the Ultremo ZX tires on my Fulcrum Racing 5 wheels besides the normal stiffness of new tires. The tubes that I have used are Continental tubes and low budget Michelin tubes which I’m currently using. Schwalbe claims that the Ultremo ZX has about 15% lower rolling resistance, longer durability and better puncture protection than the predecessor. Since this was the first time I used the Ultremo ZX I have not been able to test if those claims are correct. After about 5000 kilometers in 1½ year I have to say I’m pretty happy with the tires. I had to replace my rear tire last year after about 1500 kilometers because it was torn, caused by a sharp branch. The new tire I mounted was also an Ultremo ZX. A remark that I have to make is that I weigh about 90 kilogram and therefore push more weight on the tire than a lighter person, which may cause that the tire wears down faster. My front tire has done about 5000 kilometers now and my current rear tire 3500 kilometers and I’m still using them. They show some signs of wear and need to be replaced within the next 1000 kilometers to avoid punctures. In these 5000 respectively 3500 kilometers I have had three punctures – all three at the rear tire – spread over the period all caused by little stones. No punctures on the front wheel and given the fact there is more pressure on the rear tire because of the bodyweight and the fact I’m pretty heavy it might have caused more punctures than with a lighter person. The performances of the Ultremo ZX have pleased me. It is a fast tire, it is pretty light compared to other tires and the claim of Schwalbe that it has lower rolling resistance than the predecessor might be right. It isn’t only a fast tire, but it also makes you look fast and good. The red tires looks really good on my bike and wheels. I can recommend these tires to people who don’t ride over 5000 kilometers a year and want some good (looking) and fast tires. If you are looking for durability or if you are riding over 5000 kilometers a year you better look for some more ‘solid’ tires. I’m pretty sure my new tires will be Schwalbe Ultremo ZX.